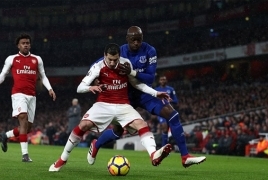 PanARMENIAN.Net - Armenian midfielder Henrikh Mkhitaryan (Arsenal) has conceded 14 fouls without receiving a booking in the 2018/19 season, talkSPORT says. In the Premier League it can be win at all costs in the battles for titles and survival. Sometimes this means players need to commit fouls to end counter attacks or deny opponents opportunities in threatening areas. Usually this would result in a caution but some superstars in the English top flight are incredibly cunning. Their sneakiness has allowed them to go through the whole campaign so far without being booked by a referee in any league game this season. Besides Mkhitaryan, there is an elite set of tactically intelligent players able to evade the long arm of the law to maintain their clean records. Pierre-Emerick Aubameyang (Arsenal), Moussa Sissoko (Tottenham Hotspur), Ryan Sessegnon (Fulham), Adrian Mariappa (Watford), Yoshinori Muto (Newcastle United), Naby Keita (Liverpool) have conceded 10 fouls each without receiving a booking in the 2018/19 season. Jonjo Shelvey (Newcastle United) has conceded 12 fouls, Aaron Ramsey (Arsenal) 13 fouls inthe reporting period. Like Mkhitaryan, Sam Vokes (Burnley) has also conceded 14 fouls without receiving a booking. Meanwhile, Mohamed Salah (Liverpool) has conceded 16 fouls, Erik Lamela (Tottenham Hotspur) - 17, Ayoze Pérez (Newcastle United ) - 27, and Roberto Firmino (Liverpool) has conceded 30 fouls without receiving a booking in the 2018/19 season.